If you want to simplify your debugging with Delphi XE5 Firemonkey on Android you can set it up to wireless connect to your device instead of plugging in a USB cable. There are two different blogs which explain how to do this and they came out months ago but if you missed it here they are. The first blog is by Jim McKeeth from Embarcadero and he shows you how to do it entirely using the command line. The second blog post is from the DAC Team at Devart and they recommend just using an app on your Android device to handle setting up the receiver. An example app that does this is called ADB Wireless (no root). I haven’t actually tested this app but there are at least 10-20 different ones in the Google Play store if you search for “adb wifi debug”. 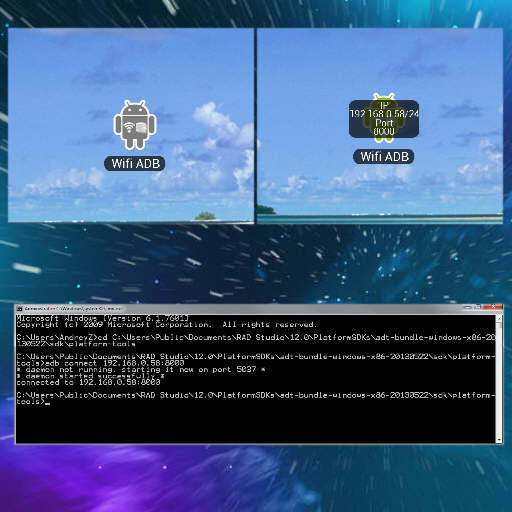 Basically the idea is that with ADB you turn on a server on the Android device and then you connect to it with ADB from your Delphi XE5 machine. Once the connect is made you can start debugging on the device without a USB cable. It can be a real chore sometimes to have the device always plugged into the USB cable and this helps resolve that problem. Read the blog post from Devart about setting up and debugging on Android with ADB. Check out all the command line commands to accomplish the Android wifi debugging in the second blog post.